A number of strong team racing results highlight the first month of Stanford sailing’s spring season. The Cardinal dominated the Jeremy McIntyre Team Race against conference competition and placed third in three different national events in the team race format, which emphasizes school-against-school duals as opposed to the open competition in fleet racing. These results earned Stanford a national No. 3 rating, an impressive mark considering all but one of their tests have taken place thousands of miles away from the team’s home venue. 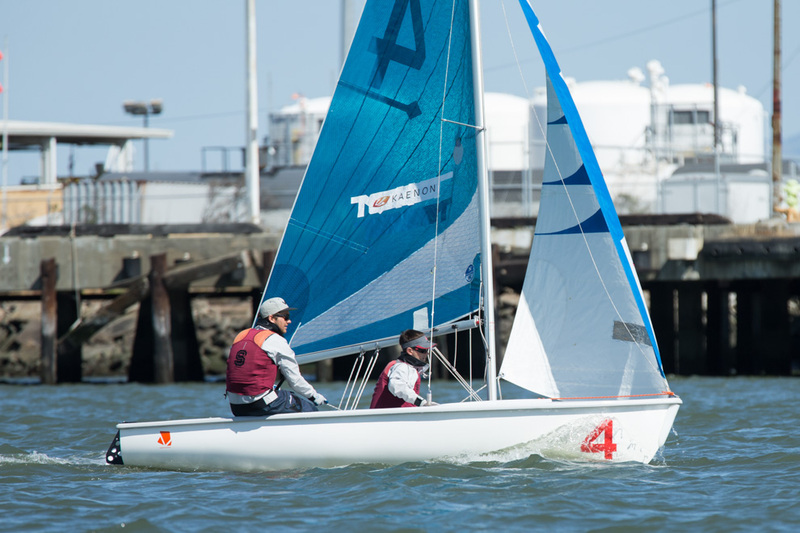 In the McIntyre Team Race in Redwood City at the end of February, Cardinal teams finished first and third out of a group that included the top competitors in the Pacific Coast Collegiate Sailing Conference, plus Northwestern and Old Dominion. Stanford’s A team put on a clinic as it went 9-0 on the weekend, landing an impressive four perfect 1-2-3 finishes, while the all-female B team nearly followed suit, coming up short just against their Cardinal counterparts and UC Santa Barbara. One week later, Stanford impressed again at the Bob Bavier team race in Charleston, South Carolina. The Cardinal’s 15-9 record landed them behind just top-ranked Georgetown and the hosting College of Charleston. Sophomore Will La Dow and senior Antoine Screve skippered the Cardinal in all 24 races while senior Axel Sly and junior Reineir Eenkema van Dijk split time driving the team’s third boat. 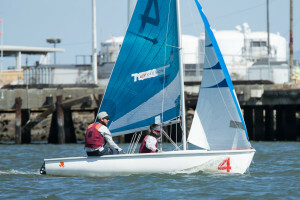 The Cardinal raced two more team race events on the final two weekends in March, heading to Annapolis, Maryland and New London, Connecticut for two stacked events. With Sly complementing La Dow and Screve in the team’s third boat, the team fell to just Georgetown and Yale at the 16-team Graham Hall Team Race on March 20-21, riding an impressive 13-2 record in the event’s round-robin to push it up the leaderboard. One week later, the team dropped to Yale and Boston College at the Jan T. Friis Team Race while using a trio of junior Lily Katz, freshman William Marshall and Eenkema van Dijk as its final skipper. With just one more team race on its schedule before the conference championship at the end of April, Stanford will look to solidify its third skipper and continue to tune-up before it begins its championship push. If the team can maintain its consistency against its increasingly cohesive competitors, it figures to contend for the title at Team Race Nationals in San Diego this May 28-30. In a break from team racing, the Cardinal also sent a team to the Saint Mary’s Women’s Interconference in Saint Mary’s City, Maryland. Stanford squeaked into fourth place in the event, taking advantage of an impressive showing from freshman skipper Martina Sly and senior crew Yuki Yoshiyasu in the regatta’s B division, putting them just 10 points off the division lead. Stanford will continue its spring season with a trio of events this weekend, including the Dellenbaugh Women’s Trophy in Providence, Rhode Island and the Lynne Marchiando Team Race in Boston, Massachusetts.